We, the overseas Filipino workers and our families, do hereby urge our Filipino compatriots around the world to support our call and initiative to protect and secure the now P1-Billion Expatriate Livelihood Support fund, which amount was taken from OWWA funds, a compulsory collection of US$25.00 per OFWs. The funds coming from OFWs were only held in trust to the government. Thus, the rightful owners and stakeholders of the OWWA funds are the OFWs themselves. OFWs and their families have all the right to protect and secure the funds. It is our rightful demand to the Arroyo administration to provide assistance to OFWs who were laid off due to global financial crisis. But to our surprise, the Arroyo administration is clever enough to take initially P250-Million to fund its Expatriate Livelihood Support program from the OWWA fund without any consultations from the real owners and stakeholders of the funds. Now, it even took the opportunity to increase the Expatriates livelihood fund to P1-Billion – all to be taken from the OWWA fund. We are not against using the OWWA funds for the welfare and assistance of our fellow OFWs who were laid off due to global financial crisis. It is in fact the very purpose of the funds. But our demands to use the OWWA funds for social and welfare benefits of OFWs and their families had been denied by the Arroyo administration since it implemented the OWWA Omnibus Policies in 2004 that practically stopped all social and welfare benefits program it has previously implemented like the family assistance loan, departure loan, among many others. More so, our repeated demands from the Arroyo administration to use the OWWA funds for the repatriation of thousands of fellow OFWs in distress and stranded in the Middle East has just fallen on Mrs. Arroyo's deaf ears. Our rightful demand to provide lawyers to fellow OFWs charged in court and on death row was always "killed" by the neglectful Mrs. Arroyo herself. It is our worries and concern that the P1-B allocated amount for the Expatriates Livelihood support fund taken from the OWWA funds will be misused and be wasted by the Arroyo administration. OFWs and their families along with the entire Filipino nation are living witnesses on the left and right corruption and bribery charges against the Arroyo administration. It alarms us because Mrs. Arroyo and the First Gentleman often pinpointed on a series of corruption and bribery charges. 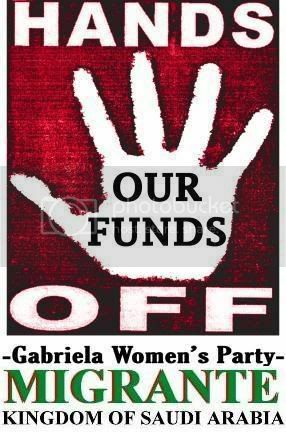 It alarms OFWs and their families because the Arroyo administration has an undeniable record of OWWA funds misuses to advance its own political interests and favors her political allies in her vain attempt to stay in power even beyond her term. It is through OFWs and their families' vigilance and concerted actions that P-10-B OWWA funds misuse and possible malversation would be prevented. Creation of a special Congressional oversight committee with representation from OFWs and their organizations and Church leaders that will look after the disbursement of the funds and ensure that it will go to the rightful beneficiaries. It is our humble aim to protect and secure the OFWs funds from possible Arroyo administration's encroachment and misuse. Let us sign this petition as a manifestation of our collective action for OFWs rights and welfare. You may sign this statement by clicking here.